I love holiday traditions! My children, at 7, 6, and 4-years-old, are now able to remember past Christmases and they look forward to our holiday traditions. 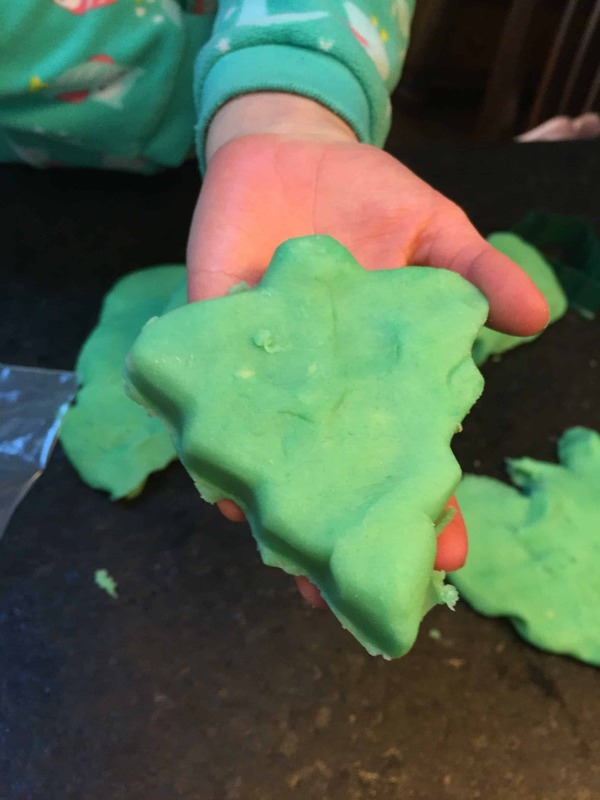 One of our favorite holiday traditions is reading and then watching Dr. Seuss’ How The Grinch Stole Christmas and playing with our very own, homemade, peppermint-scented, sparkly Grinchy Dough! Over the years, we have shared this dough with friends. We have gifted it to cousins, given it to mom friends who are under the weather, and hosted playdates specifically to play with the dough. I’ve had three friends text me in the past couple of weeks for this recipe and so I thought it only fitting that I share it with you all! 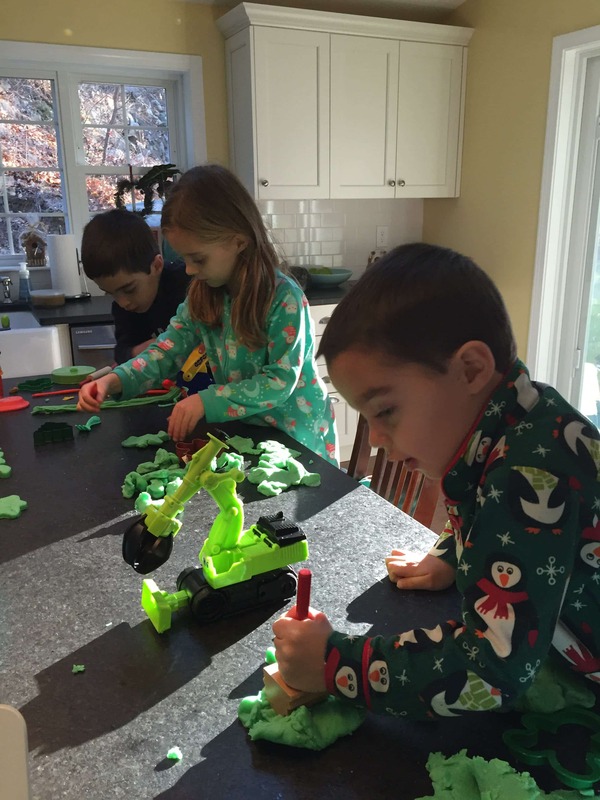 Last year, Leo wrote a blog post in which he shared our Grinchy Dough recipe. 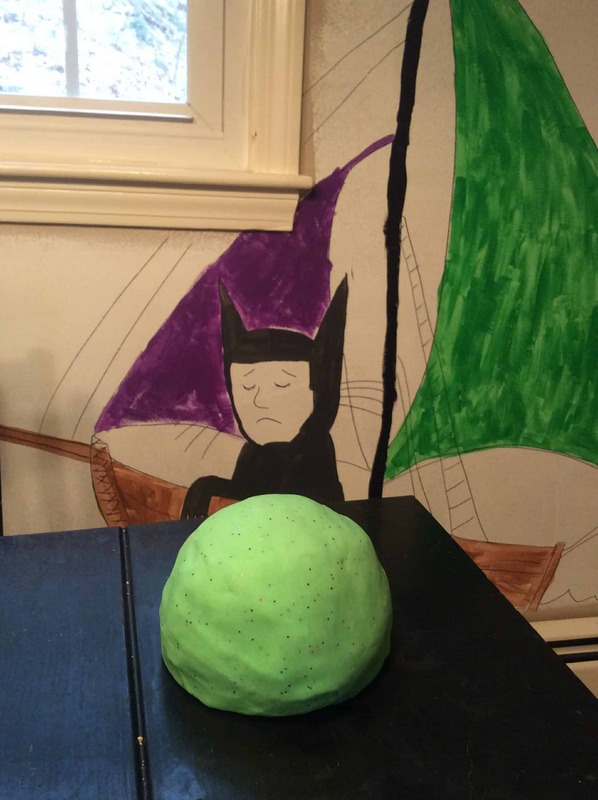 Today, I’m sharing his post for all to see and enjoy! 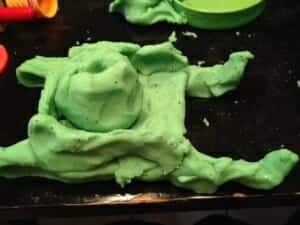 Today, for my homeschooling, I was in charge of making holiday play dough. 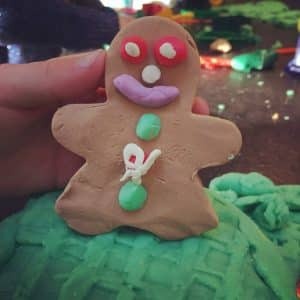 I am going to tell you how to make your own holiday playdough. 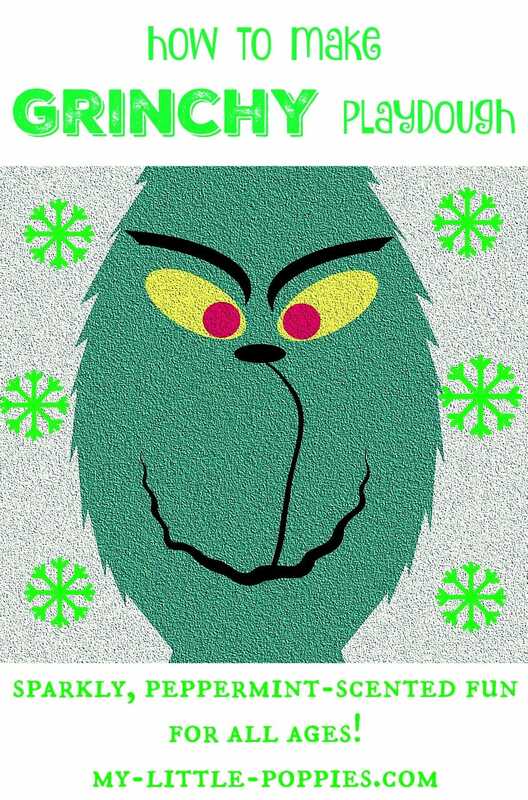 We call it Grinchy Dough. I got to teach T and Seuss how to make it today. 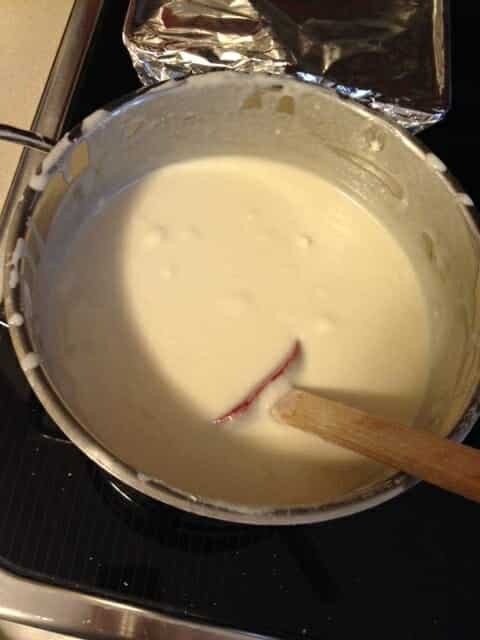 I did one batch and then they did the other and I showed them how. It was fun to be the teacher. 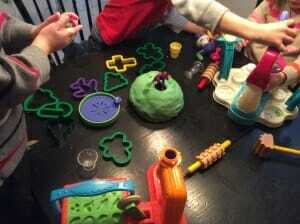 We have A LOT of play dough now! In our house, we like to make it green and sparkly and then we call it “Grinchy-Dough” but you can use any colors- be creative! Today, I am going to tell you how to make your own holiday play-dough today. YOU WILL LOVE THIS! 1. Gather all of your supplies. Make sure you have enough of everything. 2. 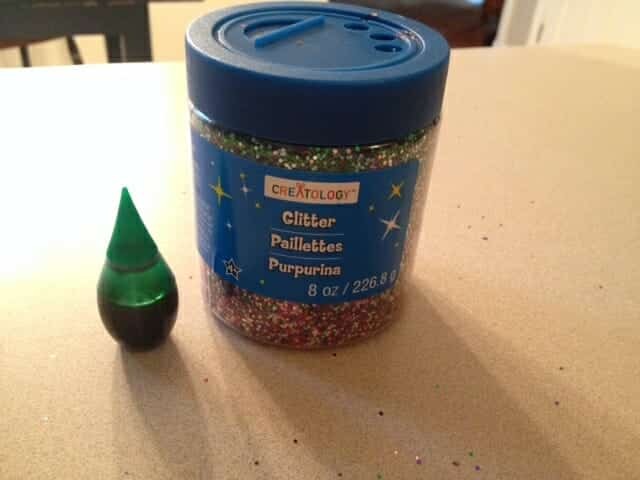 Combine all ingredients except for the food coloring, glitter, and peppermint extract. 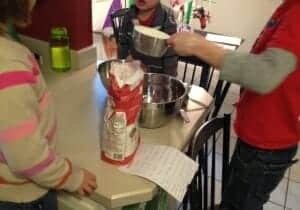 This was me, teaching my brother and sister how to make the play dough. 3. Heat on low heat. Stir frequently. 4. You have to be VERY patient. 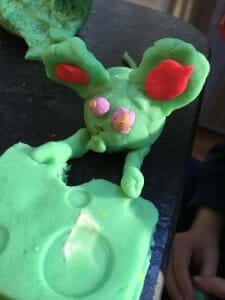 It takes a long time for the dough to turn from a liquid into play dough. 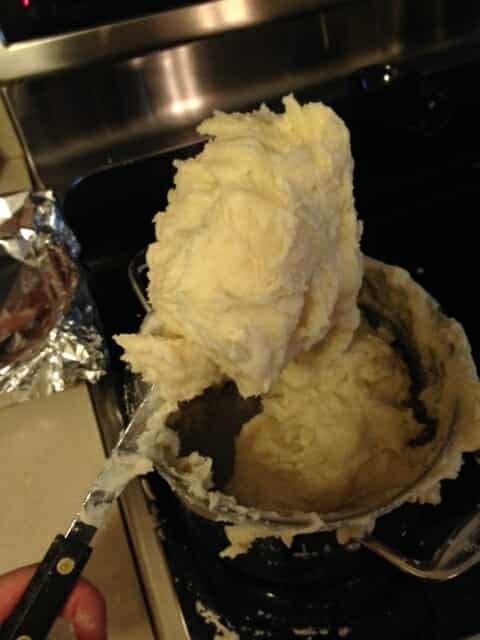 It was ALMOST ready here, but still sticky. Be patient! 5. When the dough pulls away from the sides of the pot and is no longer sticky, you can turn off the stove. Make sure it isn’t sticky! 6. Let the dough cool. 7. When cool, smooth in food color of your choice, glitter, and (if you want) peppermint extract. This is what we used for our Grinchy Dough! In case you’re wondering why we have Max in our kitchen, sailing in and out of weeks and almost over a year, click here. 9. Gather all of your play dough tools and have a wild Grinchy play dough rumpus! We figured out that today, for this homeschool activity, I did: math, science, reading, writing, typing, photography, explaining, teaching, cooperating, and creating with this activity. And my mom said because there was Christmas music and singing, that it could count as music too! And it was all VERY fun. Enjoy! Please try this recipe and let me know how yours turned out. What color did you use? What did you make? We made pizza, ice cream, mustaches, cookies, and LOTS of other things! 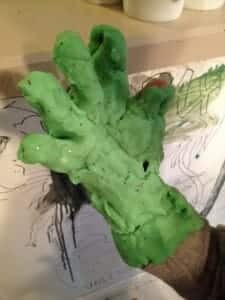 This was my favorite thing that I made: a Grinch glove! This is Santa’s sleigh with his bag of presents in it. PS. 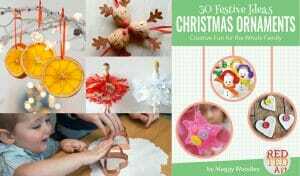 If you like this craft, please CLICK HERE to see my Papa’s Ornament Tree craft, and click here to see my Melty Crayon and Glitter Ornaments. PS. #2 CLICK HERE if you want to see my TOP 10 Ways for Kids to Give Back and CLICK HERE to play my Spot It Game! PS. 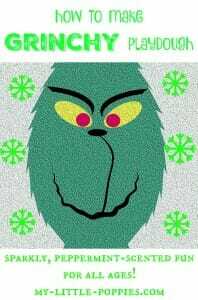 #3 If you like Christmas music, CLICK HERE to hear me play Jingle Bells and CLICK HERE to hear me play Jolly Old St. Nicholas.